Q. Perhaps we could start by talking about the role of women in the Palestinian national movement in the occupied territories, and especially about their role in the intifada. A. On the more general point, I will be very brief. Women have been involved in the national struggle since the beginning of the 'Palestine problem'. They have been active since as early as the 1920s, although until the revolution of 1936, this was confined to urban women who had the opportunity to receive education or who were related in some way to men active in political life, the elite. Rural women did not participate in political life because rural men also did not. In the uprisings of 1921, 1923, 1929 and 1933, women had little opportunity to take part with rural men. The 1936-1939 revolt was the first time that Palestinian women actually went into the mountains smuggling arms or carrying food or water into battlefields. Although the role of women was rather traditionalist in this form, my research has shown that there were women who took up arms just like the men. Women carried the economic burden during the period when the men were in the mountains. It is estimated that some 10,000 men took part in the revolution, out of a total population of less than one million. The economic burden that this entailed has often been ignored. At this time, urban women were organising strikes, providing aid to prisoners' families, holding conferences and issuing leaflets which were noticeably more radical than those of male organisations. This was because the men still hoped to be able to persuade the British to renounce their support for Zionism and had not developed a full critique of the mandate system as a whole. With the exile of 1948, women in different areas played different roles which were mainly economic, unlike in the rest of the Arab world where women were more integrated into the national struggle. This point is often ignored. This does not mean that Palestinian women lacked consciousness, but with the creation of 650,000 Palestinian refugees and the economic burden this brought, Palestinian women began going out to work, selling vegetables, cleaning houses-a step towards the proletarianisation of peasant women. Economic life for the refugee women was transformed and this change played a role in developing women's independence and consciousness in a political, rather than feminist sense. In the territories occupied in 1967, women were involved in organising before the occupation but, like the men, they tended to favour the wider Arab ideologies like Baathism and Pan-Arabism. Being under backward Jordanian rule did not help West Bank women to advance politically. In this period women in the West Bank were generally confined to working in charitable organisations and other traditional female roles. After '67, active women gravitated towards the various PLO factions which put no particular emphasis on women's organisations. Most Palestinian women say 'Let's solve our national struggle first and then talk about our situation as women' . Rightly or wrongly, this has been the state of play for the last 21 years. This said, women have played a role within the organisations, which is important for them as women. People like Rosemary Sayegh have tended to ignore that for an Arab woman to be in a political organisation necessarily means breaking down barriers, being more self aware than women who are not involved in politics. If I might generalise, in conventional society it is possible for man to know about Marxism and to be heavily politically involved but to still confine his wife or his daughter to the house. For a woman to be politicised, she must have fought and she cannot retreat because traditional society will no longer accept her. The only path open to her is to become more revolutionary. This is not because Palestinian women are better than men but because they have no choice. Q. Are you talking only about urban women now? A. No. Between 1948 and 1967, it was urban women who worked in charitable societies while rural women worked on the land and in the house. This said, rural women are more economically independent and have more say in the household because they share in production. They do not wear the veil and are more open in their relations with men. From 1967, more rural women became involved. When I was in prison in 1975, almost half the women there were rural. Now rural women are in the majority. This brings us to the intifada and to the fact that most tasks are being carried out by women. Q. Let me interrupt for a moment. 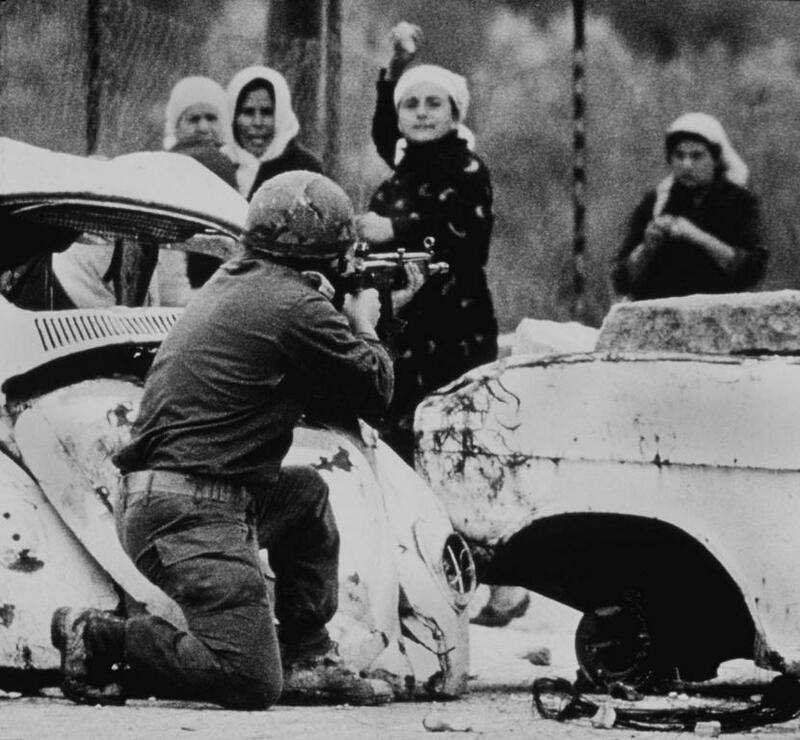 What proportion of women were involved with the PLO before the intifada? A. The best I can say is that it was a growing number. Q. But are we talking about the PLO as a mass movement or as a small organisation with mass support? A. Until the intifada, thousands of people were enrolled within the PLO, with even greater support outside the organisation. Now, a large percentage of politically active men and women are involved with PLO organisations. Support for the PLO in rural and urban areas, in the 1948 and the 1967 territories, is massive. To return to the intifada, the long history of women's involvement and growth in consciousness has not developed into feminism but has produced an increasingly active female role. Without the women, it is debatable whether the intifada would have continued for the last ten months. Women's involvement in the intifada is on two levels: mass participation and the organisational level. The women's organisations which have developed over the past 20 years are now geared towards organising for the intifada. The popular committees, for example, are dominated by women. They are active in the medical relief committees which gather information about people's blood groups and pass the information on to the hospitals. The health committees supervise sanitation to prevent epidemics and check the water in the wells because the Israelis are cutting off supplies of piped water.' Women form the majority in the education committees which organise alternative studies in houses to substitute for the schools which the Israelis have closed down. The aid committees go to areas which are under curfew or siege and distribute food, money and moral support. The Israelis have difficulty in dealing with these committees because they involve women, not only those who are involved in political groups or women's organisations but also other women. Q. Does this mean that sexual segregation has been broken down during the intifada? A. Yes, and this is even clearer on the mass level. In towns, villages and refugee camps, women guard their neighbourhoods with knives and clubs, staying awake for three or four nights at a time. Women are at the front of demonstrations, many of which are comprised only of women. Women who are not in the popular committees nonetheless play a role in social organisation. One woman told me how she and her friends make sure that no-one goes hungry during a curfew, even if it means clambering from roof to roof. Women are not telling their children to stay indoors but are saying: 'Don't forget to take an onion with you' to counteract the teargas. A neighbour of ours has four children, the oldest five years old. A year ago she would tell her children to play inside because she is a teacher and, in her view, children are not supposed to play in the streets. Now she goes out with a camera to photograph her children playing at making roadblocks! This may not sound like much but it is important because it shows she is proud of her children associating with the intifada and also because it is dangerous to take photographs - if the Israelis saw them, they might arrest her husband or beat the children. There are many examples, like all the houses which open their doors to shelter boys or men who need to hide. Women are protecting men from being arrested or shot. A woman in Toubas was shot dead shielding a boy with her own body. This was the second time she had stood between someone and Israeli bullets. I interviewed a woman who intervened when troops were about to shoot a young man. 'Is he your son?' they asked her. She said, 'No.' 'Is he your husband?' 'No.' 'Is he your brother?' 'No'. 'So why do you want me to shoot you instead of him?' She did not need to answer. Women are moving away from being family oriented towards a more nationalist orientation. Another woman went to picket a prison and was asked which prisoner was her son. She replied that all the children of Palestine were hers. Perhaps it is premature to discuss the impact of the intifada on the role of women, but Palestinian women in the occupied territories are practising feminism, not discussing it. It will be very difficult for men to say to the women, 'Now go back home!' Many women can say, 'But I have done so much more than you. ' This is all the more true with so many men having been detained. Women are active in every field, there is no sexual division. Q. Do you mean that women do everything but men's roles are still defined? A. Yes, that's right. Women are accepting the double burden of providing aid and relief, and going onto the streets. Q. Are we talking about the development of a whole new life style or is it just women who were previously politicised who are active in the committees? Has family life in general changed? A. A large number of men of the occupied territories are oppressed (as migrant workers) in Israel, humiliated, treated like dogs. When they get home they often take their wounded pride out on their wives and children. With the intifada, men have begun to regain their pride and things are changing on two levels; firstly, they are less humiliated and bitter and secondly, their wives are not sitting at home waiting perhaps to be beaten up. While the husband has been working, she may have been at a demonstration or gathering stones or involved in some other action. When I was last in Palestine, I went out on a massive demonstration and there I met my brother and my sister-in-law. She had left her child at home so she could come on the demonstration. She felt she could not stay at home and simply watch. My mother was dying to go to the demonstration but had to stay and look after the baby. Q. So the older women are taking on that burden. A. Not necessarily. That's not the end of the story. My sister-in-law later returned to the house to release my mother. If my mother had not been around, my sister-in-law would have gone to the demonstration with the baby. But my father has never been politicised and he tried to justify to us why he had not gone on the demonstration, by saying that his leg hurt and so on. He has never felt the need to do this before but - and this is the point - my father felt ashamed. Q. Presumably this sort of social pressure is similar to that which operates against people who have been collaborating with the Israelis. A. Yes, although, of course, my father was never a collaborator. Q. So there has been a shift in the power relationship between men and women. A. Yes, but it is not explicit. My mother does not say to my father, 'Go to the demonstration.' But neither does my father say to her, 'Don't go' . He cannot, because everyone is on the streets. Q. What about child care? Are women dividing it amongst themselves? Q. Is this done along generational lines? A. Well, certainly older women who cannot go onto the streets playa larger role and that seems natural enough. At the same time, I have seen elderly women take to the streets. Q. Do religious norms play a role in the relationship between men and women in the intifada? A. I have to admit that people have seemed more religious since the intifada began but this has not prevented even those women who are veiled from going on demonstrations alongside men. Let me just say this much about Islam in Palestine. In the 50s and 60s, the Palestinians turned to different political groups, the Baathists, the Nasserites. They all proved to be failures. So people have turned back to religion. In a Muslim society it is easier to turn to Islam than to Marxism. The Iranian revolution encouraged this. Q. Has this affected women's organisations? A. No, it hasn't. There are some veiled women in the political organisations, but in general they are involved with religious organisations, not the PLO groups. But let me say something else. Women are actually feeling that they are stronger than men. For example, an Israeli patrol stopped in front of our house and took away a man's identity card, saying they would return it if he removed a Palestinian flag that was flying from a high position. Suddenly, five women arrive on the scene, march down the street and say, 'Did you give them your ID card, you fool?' 'Yes', he says. They push him away, follow the patrol and bring back his card. These were not educated women from the elite, but simple women. Q. Is this true of the Gaza Strip as well as the West Bank or are there differences? A. Both are occupied, both have settlements and both are oppressed. What makes Gaza a more difficult situation is the higher population density, the more extreme poverty and lack of access to the bridges [into Jordan]. Educational standards are also lower, most schools being UNRWA schools. These factors have made the Gaza Strip a more fertile breeding ground for religion, so many Gazan women are religious and wear the veil. But often this religiosity is combined with a fighting spirit that makes many of the women there really tough. But I do not want to separate the religious groups from the framework of national struggle. 'Islamic Jihad' is part of the PLO inasmuch as it is one of the five groups in the leadership of the uprising. It is working within the nationalist movement and cannot have a purely religious platform. I want to conclude by stressing a couple of points. Firstly, the involvement of women in the national struggle has affected the position of women in the social strata and in the family. The process has been slow but that has made it stronger and it will not collapse when we have our country. Women will not be pushed back as they were in Algeria. Feminism has been a process which has developed without discussion within the community of Palestinian women. I cannot really talk much about the future but I think there will be more women's organisations. I also think we will have more women playing a prominent role in the national struggle and in our liberated country. Secondly, I believe that the intifada would not have continued this long without the participation of women, be they women who see their children gunned down, women who work in the popular committees or women who go out into the streets. In towns, villages and refugee camps, women guard their neighbourhoods with knives and clubs, staying awake for three or four nights at a time. Women are at the front of demonstrations, many of which are comprised only of women.